MASH stands for “Modern American Steak House”, and this restaurant brings the best of the classic US culinary institutions to Brewer St. in central London’s Soho neighborhood. MASH‘s main claim to fame is quality preparation of some of the finest cuts of meat in the world— Japanese Wagyu, Danish dry-aged beef, and of course succulent American corn-fed beef, but the recently revamped cocktail list is creating a well-deserved buzz around town. Inspired by a tasting and exploring trip around the United States, head barman Miroslav Panos and a talented supporting crew came up with some inspired concoctions mainly based on classic American spirits like bourbon and rye but also including a couple of interesting tequila-based libations and even an intriguing absinth-based “La Fee Verte” (The Green Fairy). The bar itself is a classy basement establishment, calling to mind an elegant 1920’s speakeasy with soft lighting, red leather stools, accents in warm shades of red and gold, and an Art Deco esthetic. The “Boston Tea Party” is a good way to start the evening (concocted from Hendricks gin, green tea, elderflower, and lemon) and the “What’s Your Fashion?” is an audience-participatory Old Fashioned in which guests can choose the flavors that most appeal. 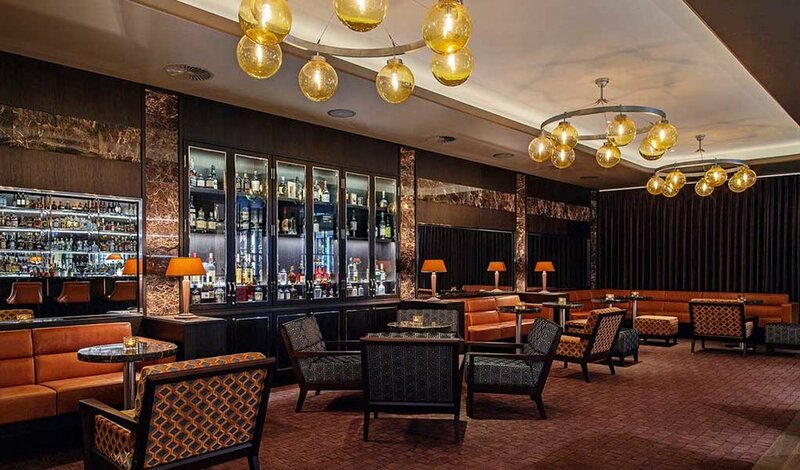 Either come for the steak and stay for the cocktails, or come for the atmospheric bar scene and exceptional adult beverages alone; this is a basement bar from which one doesn’t want to ascend too quickly.